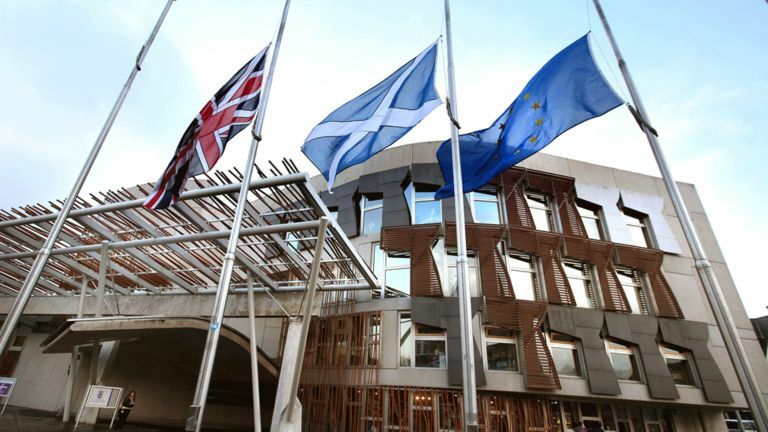 Probashbangla24 online Desk : SNP MPs would “undoubtedly” vote for a new Brexit referendum if it were put to them at Westminster, the party’s leader Nicola Sturgeon has said. Campaigners have been pressing for a fresh vote on the exit plans which result from talks with EU leaders. 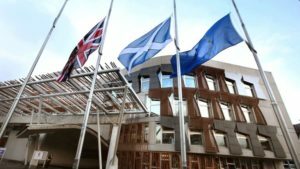 The Scottish first minister said the UK was heading for a “cobbled together” exit agreement, which would be “almost as unacceptable as no deal at all”. She said MPs would come together to avoid a “fire or frying pan” situation. Prime Minister Theresa May has rejected the idea of a “people’s vote”, saying that “we had the people’s vote, and the people voted to leave”. However Labour’s Brexit spokesman said his party could back another referendum, which could offer voters the chance to stay in the EU. The SNP’s conference will open in Glasgow later, with Ms Sturgeon due to address the event on Tuesday. The UK is due to leave the EU on 29 March 2019, but negotiations on an exit agreement have been bogged down over the future of the Irish border and the future financial relationship. Both sides had hoped to finalise the so-called divorce agreement and agree a statement on future economic co-operation by an EU summit on 17 October, but EU officials say it may be November before a deal can be reached. This would then be put to MPs in a vote at Westminster, as well as being ratified by the remaining EU member states. Ms Sturgeon told the BBC’s Andrew Marr programme that any deal brought back from Brussels would be a “fudge”, which would be almost as bad as no deal at all. She said the “Article 50” deadline of the UK leaving the EU in March 2019 should be extended if necessary, to allow more time for talks. She said: “The House of Commons and the country as a whole doesn’t allow itself to get into the position of fire or frying pan, where Theresa May says ‘well the deal I’ve brought back is as good as I can do’, nobody really knows what the future relationship is going to be like – its outside the single market and customs union, but you’ve got to accept that or no deal. “If we’re in that situation our MPs will bring forward proposals to stay in the single market and customs union, we will push for the extension of Article 50. “If people start to face the reality of that precipice of a no deal, then I think sensible options have to come back on the table.” And the SNP leader said her MPs would get behind the proposal of a new referendum on Brexit if the talks end without a satisfactory deal. “We would want to talk to people to ensure that Scotland doesn’t end up in the same position all over again, where we vote to remain in the EU but find ourselves facing exit completely against our will. 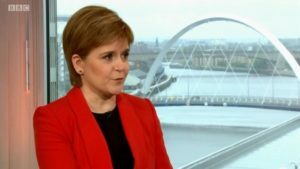 Ms Sturgeon also repeated that she would set out her views on the prospect of a second Scottish independence referendum once there is clarity about Brexit. The UK government has set itself in opposition to a second referendum either on Brexit or independence. Mrs May told the Conservative conference that the June 2016 referendum had been the real ‘people’s vote’, adding: “A second referendum would be a ‘politicians’ vote’ – politicians telling people they got it wrong the first time and should try again. 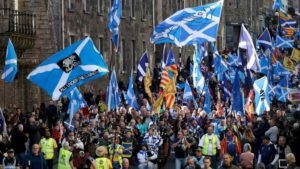 Thousands of delegates will gather at the Scottish Event Campus in Glasgow for the SNP conference, which will include motions on reusable plastic, compulsory CPR training in schools and the devolution of migration policy. 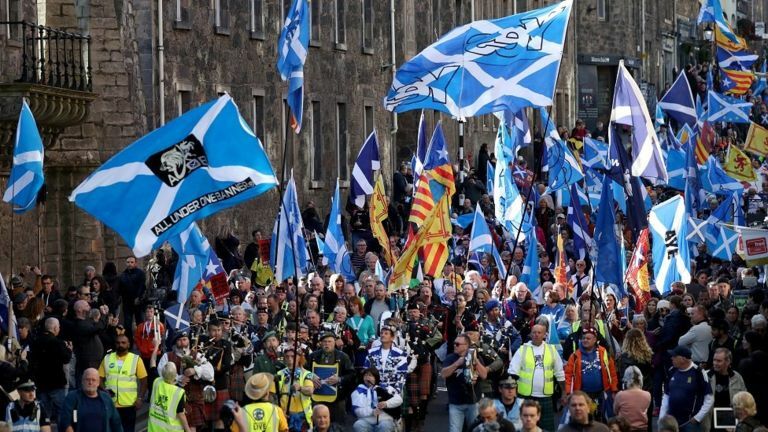 There will be no discussion of independence or a second referendum in the main conference hall – although both will feature at fringe events and in speeches from party figures including deputy leader Keith Brown and Westminster group leader Ian Blackford. Ms Sturgeon had called for another vote on independence immediately after the EU referendum in 2016, but her plan was temporarily shelved after the SNP lost 21 seats in last year’s general election.